I bet you thought we forgot about this guy. I know we think you forgot about him. Powered by strong electrical currents, Eel uses bursts of electricity to shock his enemies into defeat. Some characters are introduced as real threats, but then get downgraded to "starter villain" status. You know, the baddie the hero defeats in their first outing just to prove they have what it takes to one day maybe go the distance. Like the Wrecking Crew. Eel isn't even that. He's a villain who could lose to a tribe of Girl Scouts. Two guys have used the name, and they've both been washouts. The first one worked as a henchman for Mr. 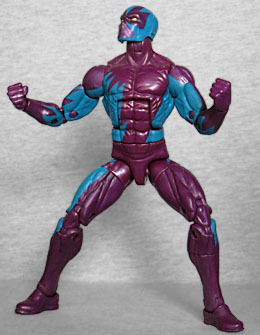 Fear, a Daredevil villain who himself rates somewhere below The Owl, the Matador, and Stilt-Man in DD's Rogue's Gallery; the second one lost a fight to Toad. And both of them have been members of the Serpent Society, despite the fact that eels aren't snakes. Of course, on that note, electric eels aren't even eels, either: they're a species of knifefish. And honestly, doesn't "The Knifefish" sound about a thousand times more intimidating than "The Eel"? Eel has a reused sculpt, because what's the point of having a generic body if you can't use it for a generic character? The costume is the source of his powers anyway. It has internal insulation, a layer of superconducting material (which is what allows him to zap people) and a frictionless coating to make him slippery. Well, probably only mostly frictionless. If it were all over, he'd be entirely unable to hold anything, stand up, or even kneel or sit down. He'd have to lay flat on the ground and hope he wasn't on a slope. Not even the head is new! It's the same fully masked mold seen on Blizzard, which is sort of fitting, since the two of them are on about the same level: deadly to civilians, but a pushover for heroes. Eel's costume is light blue and purple, like an overgrown Sweetheart "Jazz" cup. Put him on a white background and relive the '90s! Even though he was created in the '60s. Or the '80s, since this is clearly the second guy (based on the pattern of his suit). The articulation is standard: head, neck, shoulders, biceps, elbows, wrists, torso, waist, hips, thighs, knees, shins and ankles. 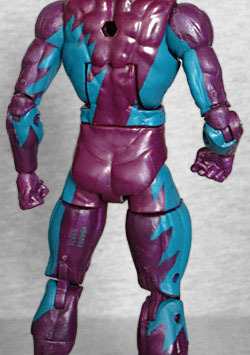 To show off his electric powers, he comes with the same kind of extra hands Electro had, which is funny since both figures were released at about the same time. Eel's are molded in yellow, with some purple paint near the wrists. The original Eel couldn't shoot lightning from his fingers, so that's another factor identifying this as the second. There are dozens of species of electrogenic fish, including the electric ray, also known as the torpedo ray - yes, it lent its name to the underwater missile, despite looking like a manta and not like a pointy tube. How did that transfer work? Because the first "torpedoes" (circa 1776) were aquatic mines, which would float just below the surface - it was about a century later that they began to be self-propelled. The torpedo ray's name comes from the Latin torpore, meaning "numb," and the fish was used as an anesthetic by the Greeks and Romans; if something hurt, they would just touch it with the fish and get a zap, like a Flintstones version of TENS therapy. Except real. Eel comes with the chest of this series' Abomination Build-A-Figure. Clearly all the money they saved by not creating any new pieces for the character went into budgeting this giant, highly detailed lump. Eel is not an exciting toy. Eel is not a popular character. Eel does not have a bright, attention-grabbing costume (at least not when it's in blue packaging, where it simply blends in). But Eel is a solid, no-frills offering and is helped out by the inclusion of a pretty crucial BAF piece. You're probably not going to want him for himself, but that doesn't mean you're not going to want him.